Students interested in careers in the engineering, architecture, and construction fields often need more guidance than what schools can afford to offer. Without the proper resources, even ambitious students are unable to hone their skills and satisfy their desire to learn. When dedicated students miss opportunities to learn about these industries because of financial issues, our community loses out on their potential human capital. For these reasons, ACE is proud to sponsor its ACE Mentor Program of America. The ACE Mentor Program of America (ACE) is a not-for-profit organization created in 1994 by the Design and Construction industries to meet their future workforce needs by mentoring ambitious high school students looking to learn more about the industry. Mentors meet with school groups throughout the academic year. 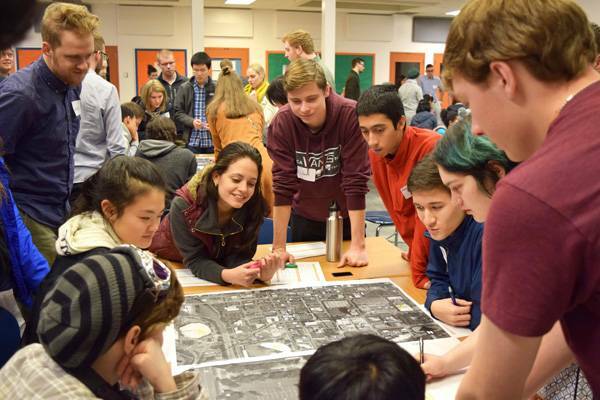 Each school/team emulates an actual design team, with students guided through a mock design project by their architect, engineer, and construction management mentors. ACE runs for the duration of the school year, and the teams meet for approximately 16 sessions, for about two hours after school. These sessions could include visits to a local architect’s office, Construction Manager’s office, a construction job site, or a working session at the school. Sessions aim to help students to learn basic concepts about the planning and design of the built environment, to open their eyes to the world around them, and to prompt them to ask questions about things they see in buildings, on bridges and streets or elsewhere in their environment. Sponsoring groups from 6 Indianapolis high schools, the program has had a real and immediate impact on young Hoosier minds. Participating schools include: Arsenal Technical High School, Decatur Central High School, George Washington Community High School, Lawrence Township (Lawrence North and Lawrence Central High schools and McKenzie Career Center), North Central High School, and Warren Central High School. Teams from these schools have completed (mock) design projects aimed at improving local Hoosier infrastructure. Students have worked a Fire Station at the Indianapolis Motor Speedway, a School of the future, a YMCA Community Youth Center, a Medical Office Building, the Georgia Street Redevelopment for the 2012 Indianapolis Super Bowl, a Commuter Train Station, and a new Ronald McDonald House. These promising young minds will likely continue their passions into college, pursuing a career in these fields. Through their future work, they will give back to the community that helped them achieve their goals, proving the societal good that emerges from a little bit of guidance and assistance. If you’d like to experience ACE’s challenges, opportunities and rewards for yourself, or would like to mentor or donate to ACE, visit the local page or contact Kay Townsend for more information.